Outdoor and underwater filmmaker Greg MacGillivray explores the secret world of dolphins in this documentary. Dolphins offers a glimpse at many of the 40 varieties of dolphins, in waters from Patagonia to the West Indies, as MacGillivray joins a group of researchers studying how dolphins hunt and communicate. In addition, the film exposes the actions of tuna fishermen who illegally attempt to capture dolphins, and answers questions about the habitat and physiology of these remarkable aquatic mammals. 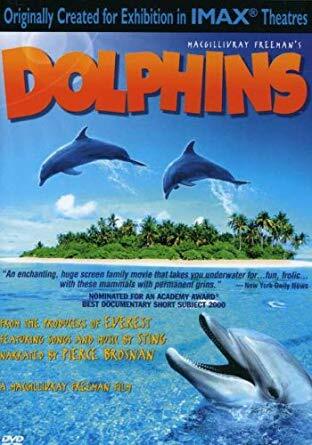 Dolphins was shot in the high-definition IMAX film format,and is narrated by Pierce Brosnan. This is one of the most inspirational nature videos of all time. Just the cinematography is enough to captivate any audience.